West Indian greats Michael Holding and Colin Croft think the current team still has a long way to go before it can claim to have "turned the corner". West Indies held on for a draw in the fifth Test on Tuesday at Queen's Park Oval to win the series 1-0 following an innings and 23-run win in the first Test at Jamaica, where they bowled England out for 51. But Holding feels that though the team has made a great start, there are some things it needs to work on. "West Indies could not have turned the corner when you look at the bowling attack that we have got," Holding told CMC Sports Wire. "We have to take 20 wickets to win Test matches, and West Indies have struggled to bowl England out in this Test series, except for Jamaica. Look at the totals England posted in the last three Tests. "When we start taking 20 wickets and bowling oppositions out and winning Test matches on a regular basis, we can then say we have 'turned the corner'. "This is a good start. Whatever method we used to beat them [England], once it is fair and above board, and we played proper cricket, it was a good start. We now need to learn from this, look at where things went wrong, and develop from there." Holding praised the side for the spirit it showed each time its fortunes seemed to be flagging. "They have fought well in this series which is something about which we are all very proud," he said. "Their backs were up against the wall on so many occasions in this series, and not too long ago, everybody would have expected them to just fall apart. "But they battled very hard, particularly in the last three Tests, which is something people in the Caribbean have wanted to see from them. We are not trying to tell anybody that this is the best side in the world, or the most talented group of cricketers in the world, but we wanted to see them fight and give everything that they can for the region. And they have done it in this series." The result also meant West Indies have secured a series victory over England for the first time in 11 years and have regained the Wisden Trophy. 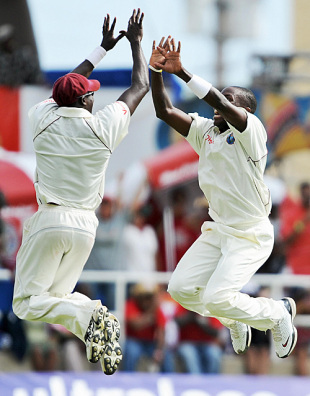 It was also West Indies' first series victory in six years against a side ranked above them in the world ratings. Croft though, was not sure if West Indies had even seen the corner. "They are still on the straight road getting to the corner," he said. "We should not get too excited. We beat England because there was a crazy two sessions in Jamaica. It was an anomaly. "If West Indies can build on this victory, yes. But we are going to lose a few cricketers very soon, someone like Chanderpaul for instance, and we need to find at least two more genuinely quick and quality fast bowlers, and two spinners, so we are going to see some changes. "But I think if they can be consistent, look good, win a few Test matches and Test series, in between losing a few, I think everybody would be satisfied." Croft also praised captain Chris Gayle for bringing the players together as a unit. "He does not get enough credit, but somehow or the other, they are playing differently with him as captain," Croft said.